Baseball Eligibility: Ages 15u (male or female) born 2003/2004. Click Here to view the full technical package for Baseball. To try out for the your Zone Team, you must attend a Talent Identification camp. Camps are held April-June 2018 throughout the province. Click HERE for more information on Talent ID. The Alberta Games showcases the province's best young developing athletes aged 11-17 in a multi-sport Games. The Alberta Games also offers many benefits to both the Host community and to thousands of Albertans who participate at local, zone, and provincial levels. Alberta Games provides young athletes an opportunity to celebrate sport involvement, and a setting to compete and further strive to attain their athletic potential. Since the first Games in 1974, thousands of Alberta athletes have participated in the Alberta Summer Games. 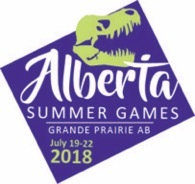 Stay connected by visiting www.albertasummergames.ca and be a special part of the Alberta Games! Check out their Facebook and Instagram pages, and be sure to join for all the exciting news and pictures of the Games.